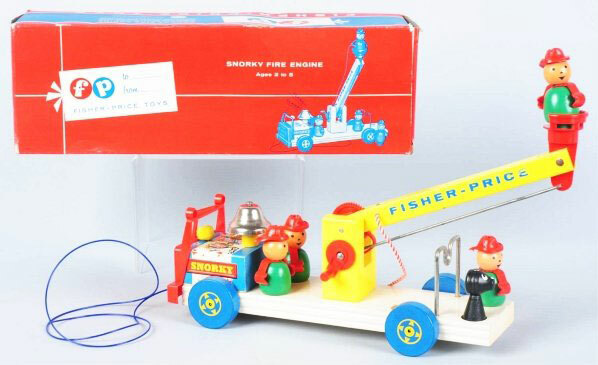 Description: Pre-dating the long-running #720 Play Family Fire Engine by a few years, the Snorky Fire Engine proved to be a bust for Fisher-Price then, though collectors feel differently now. The #720 fire truck is certainly much more meticulously designed with attention to it's lithographs. The Little People--if they can even be considered such--are a different story. The dog is similar to those used in other sets of that era, such as the #234 Nifty Station Wagon. The firemen are a creation all of their own, and it's doubtful that Fisher-Price were all that pleased with their strange appearances, since they were all but out of the Little People regime by 1962. After 1 year, #168 gave way to a redesigned #169 Snorky Fire Engine, which too lasted only a year before being discontinued. Along with the #932 Amusement Park, the 2 Snorky sets are the most valuable and expensive Little People playsets, fetching several hundred dollars each. FPT533 - White wooden base fire engine with a yellow wooden ladder that cranks up and down while the red plastic basket on the end of the ladder holds the Snorky fireman upright. The ladder is 9-1/2" long, spins 360 degrees, and has a red and white rope fire hose with a red plastic nossle on the end that comes out of the side. The front of the firetruck has a red plastic grill and windshield. The square "engine" has "SNORKY" written on the side and has a metal bell on the top that rings as the firetruck rolls. Measures 15" long, 5-1/4" high, and 4-1/4" wide. 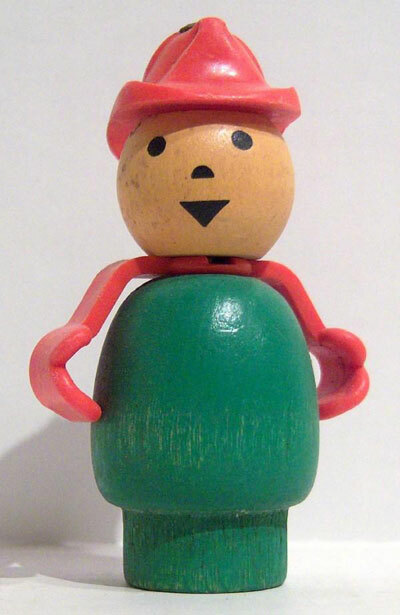 4 each - CGWW - Green wooden body fireman with red arms and a red fireman's hat. The arms are designed to be able to hold the fire hose. These firemen have a rivet running though the top of their heads. 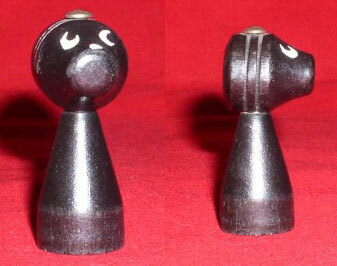 HMWW - Black wooden conical-shaped dog with a pointed black face. This Fire Engine was only sold until Easter of 1961. Also see #169 Snorky Fire Engine that was introduced in 1961.